alaTest har samlet og analyseret 23 anmeldelser fra magasiner og hjemmesider. Folk kan virkelig godt lide pålideligheden. Vi analyserede bruger- og ekspertratings, produktalder og andre faktorer. Sammenlignet med andre Stationære Computere får Intel Skull Canyon NUC6i7KYK en samlet alaScore™ på 93/100 = Fremragende kvalitet. Packed with a quad-core processor and Intel's highest-end graphics, the latest Next Unit of Computing was designed to play games. The kicker is that you actually can. Muddled by confused marketing, the Skull Canyon NUC is an excellent mini PC for productivity with some light gaming on the side. Gaming on integrated graphics. Can the powerful Intel Iris Graphics 580 replace a mainstream Nvidia GPU for gaming? We pit the NUC against systems with integrated and dedicated graphics solutions to find out. Quad-core i7-6770HQ delivers snappy productivity performance in a 0.68L package. Solid connectivity options including Thunderbolt 3.0. Integrated graphics still only good for casual gaming and external GPUs will be limited to PCIe 3.0 x4 bandwidth. Pricier, hotter and louder than rival units. Intel's latest NUC is the Skull Canyon NUC6i7KYK Mini PC and today we fully put it through its paces to see what it can do. 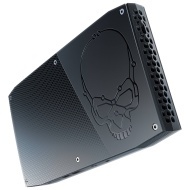 The edgy look of "Skull Canyon"—Intel's killer new Core i7 NUC PC kit—hints at a first among these truly tiny PCs: graphics upgradable via Thunderbolt 3. It's the most forward-looking mini-PC ever. The Intel Skull Canyon NUC offers speedy performance and can power multiple 4K displays, but it doesn't have much to offer serious gamers. Das Skull Canyon ist nicht so sehr ein Gaming-Gerät wie ein vielseitiger Mini-PC mit mehr CPU und GPU-Leistung als die meisten teureren derzeit am Markt verfügbaren Ultrabooks.